Hillsong Goldens has World Class of Champion English Cream Goldens. Originally from Europe, we breed only with the best lines and reward your family with Pure, Healthy, Obedient, Social, Breathtaking puppy. All puppies are AKC registered with Immunization and Wormed. We are committed to make your PICK process clear and quick. Below, you will find the steps of the process. Some steps are subject to negotiation based on the needs of the buyer or the puppies. All questions or comments are welcomed. The purpose of the conversation is for you to let us know your puppy of choice AND for us to learn about the environment you will provide for one of the Hillsong Goldens. All questions welcomed! 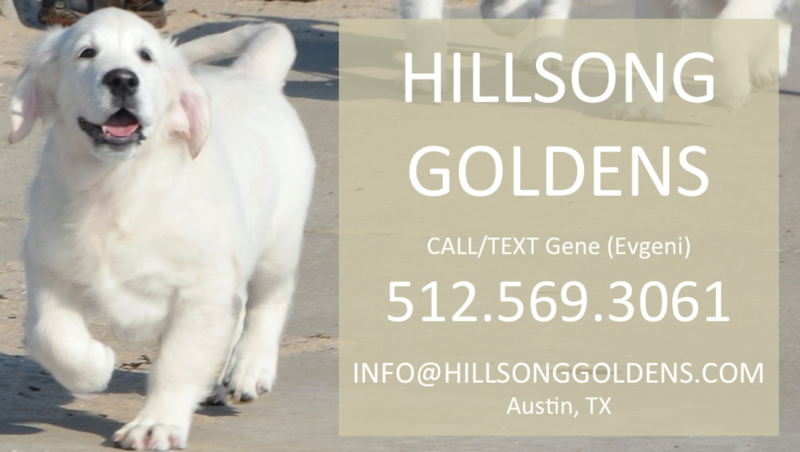 YOU need to deposit $250 to be on THE LIST for Champion English Cream Golden @ Hillsong Goldens. YOU reserve the available NEXT PICK. Let us know if you want a BOY or a GIRL, as PET or FULL REGISTRATION. FIRST PICK when available is always FULL REGISTRATION and the buyer takes care appropriately for the dog by showing and breeding it. WE prefer the deposit to be done by PayPal. You can also pay by your choice of Cash or Check. WE will email you a Guaranty/Receipt by email once the funds are received. Deposit is refundable in case you want to walk out. No questions asked. YOU make your PICK when puppies are SIX weeks of age. WE will email multiple pictures of each puppy. Starting with the person having the FIRST PICK we email every one on the list. Each person has 8 hours to make a decision. YOU pick the name of the puppy. His/hers name will start with “Hillsong.” (Example – Hillsong Spring Dream. This will be the official recorded name. You can have any “Call” name if you choose to. WE will inform you when the puppies arrive. WE confirm that there is a puppy available. WE will confirm your pick. At that time YOU owe the 50% BALANCE. If you have contacted us after the pups have been born, YOU owe 50% of the price. YOU deposit 50% of the balance at the SIXTH week, after you make your PICK. THIS is the last moment to decide if you want to go for a Pet or Full registration. THIS is refundable if for whatever reason you want to walk away from the deal before the PICK UP DATE at the end of the EIGHT-WEEK. YOU are responsible to PICK UP your puppy on the pre-scheduled PICK UP DATE, usually on the Afternoon of the 1st Sunday after the puppies have turned 8 weeks. You need to have your own crate. YOU may choose to fly your puppy. The average estimated price in U.S.A. is $390. This includes airplane ticket, approved crate and veterinary health certificate. We cooperate with you to book a flight that works for you and the puppy. Full payment must be received before flying a puppy. YOU may choose to PICK UP your puppy later then the specified Sunday. We are glad to give you this option and provide care for $100 a week. YOU will be provided with AKC LITTER registration papers. YOU will be provided with records for current shots and worming. YOU will be provided with a GUARANTY document that you need to sign, discussed with you in advance. HILLSONG GOLDENS RESERVES ALL RIGHTS TO TAKE BACK THE PUPPY IF THE OWNER HAS MISTREATED THE PUPPY, the NAME OF THE KENNEL, or in case PAYMENTS HAVE FAILED THROUGH. THE VALUE (if paid, and defined on pg. 9 in the Contract) WILL BE REFUNDED.